This fourth day of the Route du Rhum-Destination Guadeloupe has (almost) been a break for most solitaires at sea: only 20 to 30 knots of wind on average and only three to four meters of hollow, except in certain areas. This "lull" allowed many of them to make a quick check-up of their mount and for some, to decide to make a technical stop to the image of Nicolas Troussel (Class40), Louis Duc (Class40) ), Romain Pilliard (ULTIME) or Alain Delhumeau (Multi Rum) ... Others have suffered a crippling damage such as Fabrice Payen (Multi Rum) who saw the mast of his trimaran Team Vent Debout , collapse following the break of a cadena: the skipper had yet remarkably negotiated the heavy weather of the Bay of Biscay! And apart from the technical problems that can not be solved at sea (and the navigators do not stop to settle many small worries on board), several competitors preferred to take refuge before the third depression which arrives already on the Azores. But this disturbance still looks powerful with more than forty-five knots before Cape Finisterre Friday noon and more than thirty-five knots in the heart of the Bay of Biscay, with a Southwest sector flow. This suggests that the state of the sea will still be terrible, with crossed swells and pyramidal waves, particularly near the Iberian coasts and around the Azores. But it is to this area that several Multi50 are headed by leaders Thibaut Vauchel-Camus and Erwan Le Roux: will they manage to pass before the front generating a free-swing from Southwest to West with violent grains? With Boris Hermann (IMOCA) who chose to transplant to the West Wednesday, they will be the most exposed. However, those who have not yet been able to extricate the Bay of Biscay will also be picked by this very muscular flow: fifteen Class40 and five rum will again face a very hard sea. 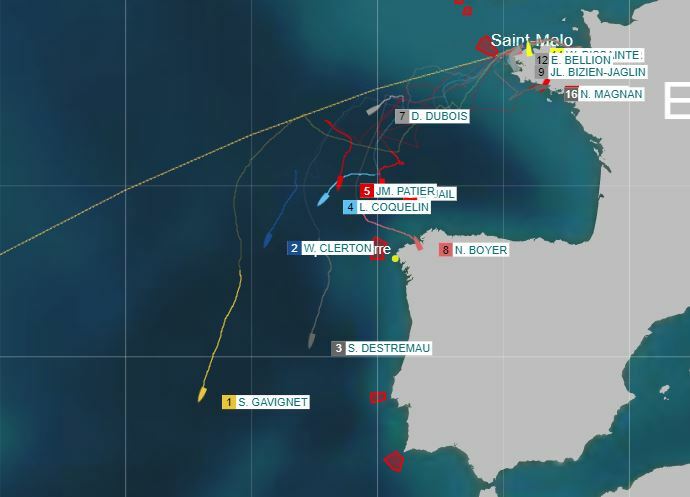 This is also the reason why solitary refugees in Breton ports are still waiting like Jérémie Beyou or Alexia Barrier (IMOCA): a meteorological opening is planned at the end of the weekend and they should be numerous to resume the course of the race after this "third layer"! 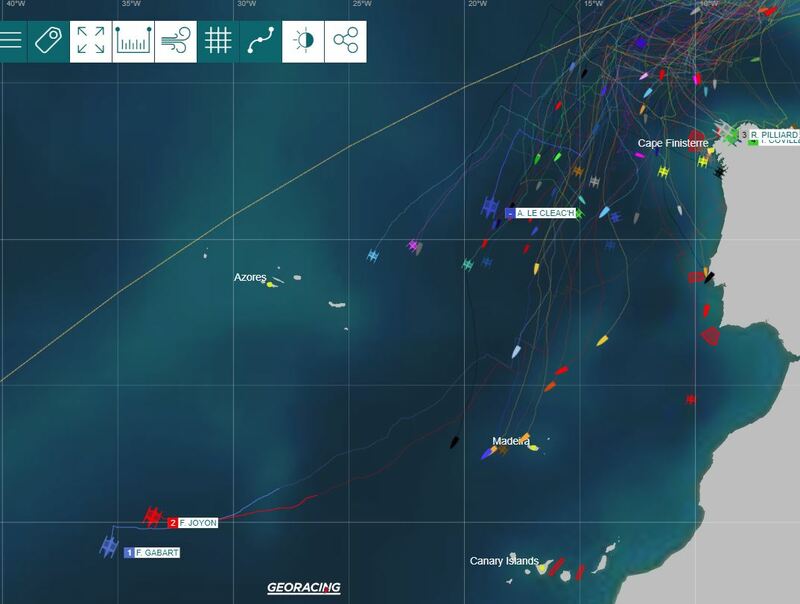 For all those who have crossed the virtual line that connects the Azores to Cape St. Vincent, navigation conditions will be totally different: already the ambient temperature has increased significantly even if the sun is not always at the rendezvous; then the wind took a more reasonable cruising speed around 15 to 20 knots; finally the sea is smooth over the miles earned in the South. 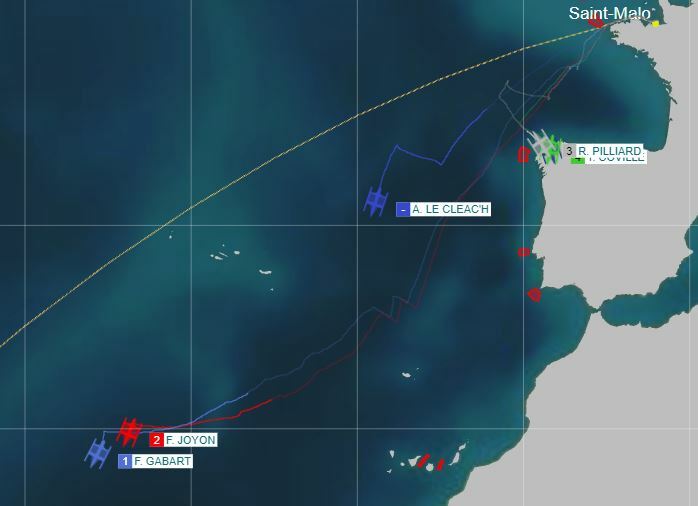 For the moment, only the two ULTIMATE trimarans of François Gabart and Francis Joyon really slip in trade winds (still sluggish) while the first four IMOCA monohulls border the high pressure off Madeira. 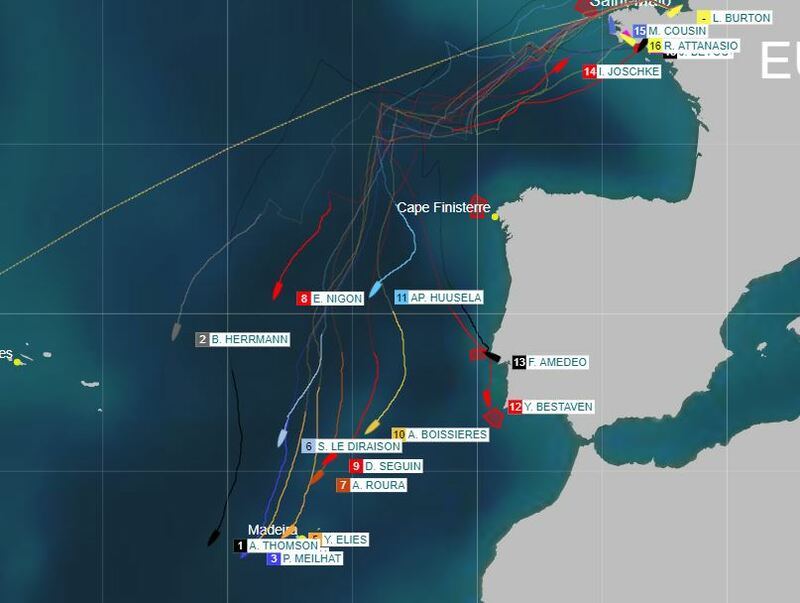 Finally between Cape Finisterre and Madeira, the configuration is intermediate and all those who sail in this area know that it is necessary this night to put coal to avoid the strongest of the new gust of wind. Like Loïck Peyron, Yann Marilley, Gilles Buekenhout (Multi Rum) who slide south along the Spanish coast or Romain Pilliard (ULTIME) who left Corunna this Thursday afternoon. Thierry Bouchard (Multi50) also knows, he who saw his mainsail carts let go, forcing him to go under reduced sails to Lisbon. This Thursday morning, just as the MACIF trimaran reached the halfway mark between St. Malo and Point-à-Pitre, and still in the lead, François Gabart considered the Ultime's Route du Rhum and admitted how much he admires Francis Joyon and how sorry he is to see the other trimarans in difficulty. What do you think of these first few days of racing? François Gabart: "The start was absolutely wonderful. I couldn't have dreamt of a better first series of tacks, reaching upwind, and then with the angle opening up a little until I reached Bréhat. I hope the pictures were good! I was really with it. I had a good start in the match. I did see that Gitana was going really fast. There's no hiding it. However, I manoeuvred better and things went pretty well around the tip of Brittany. 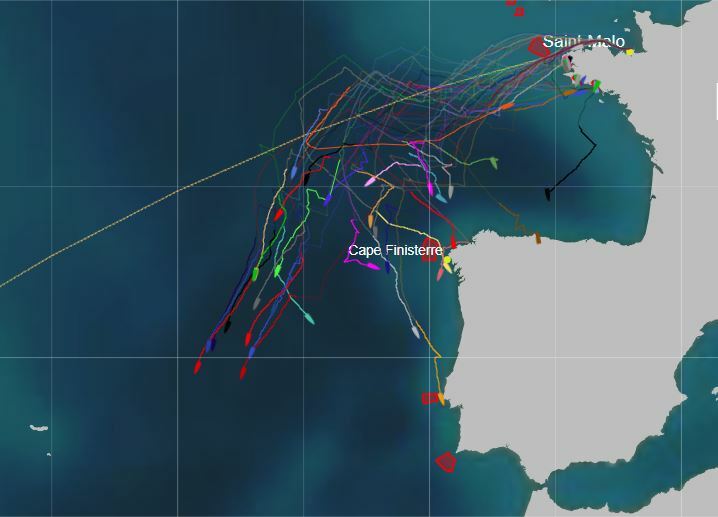 I am happy with the way I got into this Route du Rhum. After that, the race did not turn out how I had imagined at all. The major damage to for Sébastien Josse's boat and then to Sodebo a few hours later changed the mood. I did not expect that at all, even though we all know that with the speeds that we reach, damage can happen. But it is surprising that it should happen to these boats in particular. Despite this, I haven't slowed down, because there's no point. I did not come off unscathed. I had some small technical problems and I spent a good part of the first few days trying to carry out repairs whenever the conditions made that possible. It was energy-intensive, since the wind was strong, and we suffered relatively little damage, except on the first night and I think that the Ultim class was the hardest hit." And then, Armel Le Cléac'h capsized. F.G.: "Armel's route was fairly tricky and it occurred to me that he would probably come back in our direction if it had worked out. Unfortunately, there was the accident. I know that he is okay. I hope that they'll be able to recover the boat and that Armel will get over it quickly." How have the last few hours gone? F.G.: "We're halfway through the course, this Thursday, and we are still under the influence of the big cold front that swept across the fleet. Clearly, we are not yet in the trade winds. We just need to get away from this front to pick up the trade winds and then the wind is with us. I'm really happy with the night I spent. I worked hard and the boat surfed well. I'm also delighted to be racing with Francis Joyon!" Have you managed to stave off the pressure a little, from IDEC Sport? F.G.: "I was a little worried yesterday, when I came to a halt and had the wind below. I was frightened that he was in a better position above and, in these instances, this can create huge distances between us. I managed to pick up the wind again and to position myself ahead and below. That's where I prefer to be. But it's going to be difficult. Francis knows his boat by heart and he also knows how to make quick speed with any multihull boat. I really admire what he can do with his boat with a minimal amount of preparation. It's crazy! I am amazed that we are in this race together. I know that it will be hard and that he won't let go. I am going to have to find the right balance, pushing myself into the red zone, but not too much. I don't want to make any mistakes in the trade winds. I will need to keep the boat flat. When you see what happened in the first half of the race, it makes you more vigilant in the second. There will be Sargasso seaweed, weather traps and FADs (fish aggregating devices), large blocks of metal or plastic installed to attract fish. If we touch them then..."
There's pleasure in everything you've shared about what's happening in this race. F.G.: "It's quite hard to talk about the start of the race, with everything that happened, but at the same time, I'm delighted to be where I am, competing at close quarters with Francis. I'm having a ball pushing forward with this wonderful boat. I have set my pace and I have kept it since the start of the race. I'm really proud of this. All that remains is to win this second challenge, which means remaining extremely focused and precise right to the end. It will mean sticking "with" it. You can count on me for that." Out of the twenty IMOCA skippers who set sail four days ago from Saint-Malo, twelve are continuing on their way towards Pointe-à-Pitre after Yannick Bestaven set off again today from Cascais.While only two competitors have officially retired (Louis Burton and Sam Davies), five others are carrying out pit stops, while Isabelle Joschke is aiming to return to Brittany after dismasting. 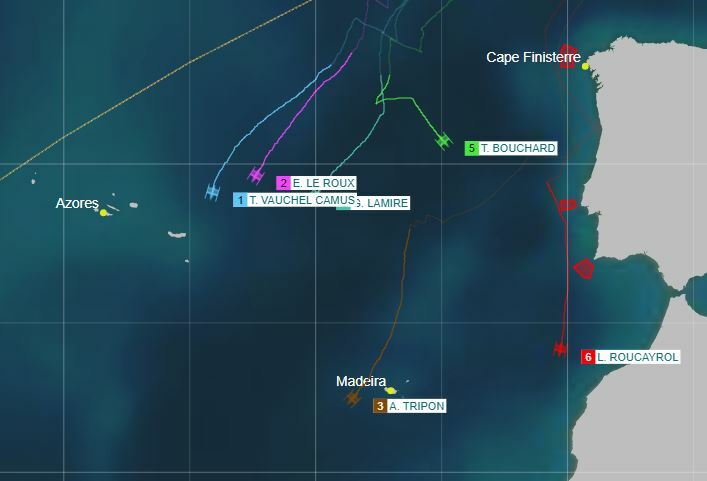 A group of four are out in front comprising Alex Thomson, Paul Meilhat, Vincent Riou and Yann Eliès, while Boris Herrmann is attempting a more extreme option. Today, it is Jean Le Cam's turn to give us his view of the Route du Rhum in the IMOCA class. "Very little between them when they get out of the ridge"
Alex Thomson is still benefiting from his westerly option and is galloping away in the lead. He has always gone for extreme options and in this Route du Rhum was the only skipper to pass the Ushant TSS via the north, even though that meant even more unpleasant and demanding wind and sea conditions. He has clocked up some incredible speeds and managed to head back south at the right moment. He has repositioned himself, as he now needs to get below the area of high pressure. It is logical that the gap from east to west between him and his rivals has narrowed. Alex, Paul, Vincent and Yann will be getting plenty of wind and taking advantage of downwind conditions today. The wind will slowly come around and those who are further south may well gain a small advantage. But I think that in the end, there won't be much between them when they leave the ridge of high pressure behind them. In my opinion, three of these four sailors will make it to the podium at the finish. "Four skippers in great form, a fantastic match"
Once they have passed the ridge of high pressure, it will be all about speed between these skippers, who appear in great form. Yann Eliès is very consistent. He is always fast and knows his boat well. The same goes for Vincent Riou, even if he does not have quite as much experience of his PRB as a foiler. In any case, it is clear that he is able to sail quickly. What more can I say about Alex Thomson? Paul Meilhat is performing very well with his boat equipped with straight daggerboards. In the trade winds, it will logically be harder for him and he is likely to lose ground to the IMOCAs fitted with foils. But having seen what he has already achieved, we may well be in for another surprise. It will also depend on whether the other boats are still fully capable or not. It may well be that some have problems they are not talking about... In any case, we're in for a fantastic match. As they get further south, the sailors will be able to enjoy themselves more. It is really a weight off your shoulders when you have more decent conditions and downwind sailing. You can breathe again, get everything dry, get some rest, look around the boat and repair what needs to be repaired. On these boats, there's always something to be done. Having said that, you mustn't run away with the idea that the trade winds are always steady, as there can be squalls. It is more relaxed, but it is not really smooth sailing either. "Proud of backing Damien Seguin"
Over the next 24 hours, this ridge will become settled blocking the path. The first four will manage to make their getaway, but it will be harder for the little group chasing after them comprising Stéphane Le Diraison, Alan Roura and Damien Seguin. All three have had a very nice race. I'm particularly pleased with Damien Seguin's position, as I've been supporting him. His performance is remarkable, particularly when you see that he is sailing with sails that were used in the last Vendée Globe. It looks like he hasn't had too many problems aboard, and he is doing well for his first transatlantic race on an IMOCA. I'm proud of him." While Thierry Bouchard, victim of damage last night, is heading to Portugal, the other five Multi50 still drive towards Pointe-à-Pitre. 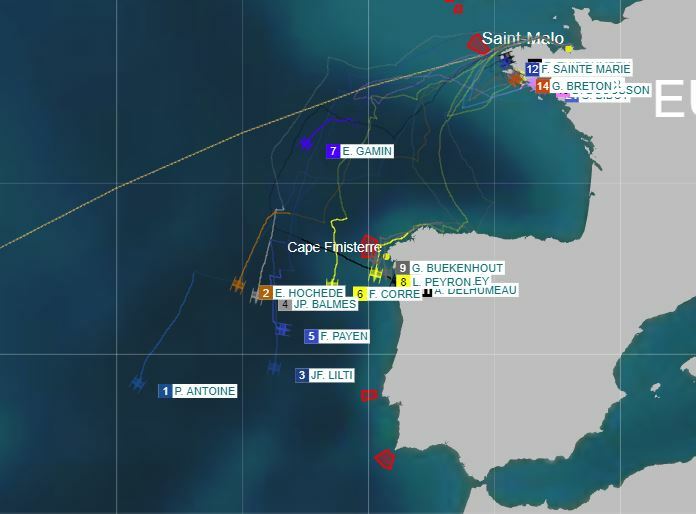 But the situations of these "small" multihulls differ between the gale that threatens Thibault Vauchel Camus and Erwan Le Roux and the downwind benefit of Armel Tripon. Well placed since the start, a time in mind, Thierry Bouchard led the fleet of Multi50 but now the race is no longer his priority. In a violent grain and an involuntary jibe, he broke his mainsail cart in the night from Tuesday to Wednesday and has nothing but an obsession: to rally the Portuguese coast. "A new front will arrive tomorrow on the North of Portugal and it is absolutely necessary that I go to the South to avoid it, " he explained in a worried voice during the session late morning. The skipper of Ciela Village set sail for Lisbon, but in the middle of the afternoon, he was still pointing more than 300 miles from the Portuguese capital. " I'm fighting to get there in time ." "I almost knocked me over"
The harshness of conditions spares no one, even Armel Tripon, the southernmost skipper in the fleet. "I almost knocked on the night from Tuesday to Wednesday. We must be vigilant every moment, even when it's going to slide in the trade wind. On the chart in my cockpit, I also wrote 'concentration' in big. But the skipper of Réauté Chocolat continues his route, he who went west of Madeira Wednesday afternoon. It gets closer to the trade winds, 30 miles from IMOCA Paul Meilhat and Yann Elies. This road due south, it is also the choice of Lalou Roucayrol more than ever of attack the day after his departure from the port of Porto where he stopped. The sailor from Arkema , who is 400 miles west of Tripon, could even dive to the Canaries, taking advantage of his position as a hunter " It can allow me to find the trade winds faster than my comrades ". Lalou has returned the smile and ensures " think a lot to my friends up there who have locked themselves to the Azores ". More than 500 miles northwest of Arkema, Thibaut Vauchel Camus (1st, 2470 miles from the finish), Erwan Le Roux (2nd) and Gilles Lamiré (3rd) advanced slower early in the day (16, 8 knots average against 25 knots for Tripon). They are especially much more exposed to the new disturbance which should begin tonight and extend throughout the night. The sea, highly trained, will complicate their progress and will require vigilance every moment aboard boats exposed in this type of conditions. I still have two-three days of fast starboard to the south of the Azores before going round the anticyclone. There are lots of little things on the boat, but no big damage, the boat is good, it is super strong, I'm really surprised, because every three seconds, it breaks a wave, it's impressive. I have more and more confidence in him, it's really great. I get to sleep well, I do not feel too tired, but I can not feed myself too much, if I eat two bars of cereals a day from the beginning, that's the maximum, I did not still not made a dish. I do not feel hungry, but as soon as it calms down, I will eat normally again. " but no big damage, the boat is good, it is very solid, I'm really surprised, because every three seconds, it breaks a wave, it's impressive. I have more and more confidence in him, it's really great. I get to sleep well, I do not feel too tired, but I can not feed myself too much, if I eat two bars of cereals a day from the beginning, that's the maximum, I did not still not made a dish. I do not feel hungry, but as soon as it calms down, I will eat normally again. " but no big damage, the boat is good, it is very solid, I'm really surprised, because every three seconds, it breaks a wave, it's impressive. I have more and more confidence in him, it's really great. I get to sleep well, I do not feel too tired, but I can not feed myself too much, if I eat two bars of cereals a day from the beginning, that's the maximum, I did not still not made a dish. I do not feel hungry, but as soon as it calms down, I will eat normally again. " but I can not feed myself too much, if I eat two cereal bars a day from the beginning, that's the best, I still have not made a dish. I do not feel hungry, but as soon as it calms down, I will eat normally again. " but I can not feed myself too much, if I eat two cereal bars a day from the beginning, that's the best, I still have not made a dish. I do not feel hungry, but as soon as it calms down, I will eat normally again. " the next two to three days, I put the race in parentheses, I was in mode you must not break anything. I just received the ranking, I am pleasantly surprised, I am happy. Physically, I'm fine, I slept a lot despite everything, I was not bad inside in the heavy weather, I had trouble on the other hand to eat, I vomited a little the first three days, but I am pretty good. I think I'll remember this first Route du Rhum, but it's not over, do not let go, morale is slowly rising, I get lots of messages of encouragement. " I was not bad inside in the heavy weather, I had trouble on the other hand to eat, I vomited a little the first three days, but I'm pretty good. I think I'll remember this first Route du Rhum, but it's not over, do not let go, morale is slowly rising, I get lots of messages of encouragement. " I was not bad inside in the heavy weather, I had trouble on the other hand to eat, I vomited a little the first three days, but I'm pretty good. I think I'll remember this first Route du Rhum, but it's not over, do not let go, morale is slowly rising, I get lots of messages of encouragement. " hours and after, it should already calm down a little. I can not wait to be in the trade winds in tee-shirt and shorts because the dry(combination, Ed) , there are tired! And the tormentin, that had never used in Class40, I have used it already three or four times since the beginning of the race. With Phil (Sharp)we do not see each other, but we are used to being not far: since I have my Class40 Aïna Childhood & Future, each time, the chance is that we find ourselves both side by side . Yoann? It's Yoann, he sends! Afterwards, at times, I may have sent a little less to preserve the boat, it is a bit for that too that he has taken the lead. But the road is still long, we will see what will happen in the trade winds. The boat is nickel and the man too. I enjoyed a quiet moment this morning to sleep a little and at the time you called me, I was going to have breakfast, because the night was a little stressful: omelette, apples of earth and sausage to hide nothing! " " Everything is fine. I made the decision last night to go to Spain not to find myself in the thick of the gale of Friday. I'm trying to get there, but there are grains, it's hard to stay on course, I'm going to the coast, the idea is to stop at Gijon, and if I'm not I can not stop there, walk along the leeward coast and leave again as soon as the gale is over. I think I'll be in Spain tomorrow in the middle of the day and leave the next day, I do not have much to do there, maybe I'll get on the mast to install a spare wind vane, I'll do some sewing on my staysail, unless I do it at sea before, but the idea is to leave as soon as possible when the conditions are favorable to pass Cape Finisterre. From the start, life on board is not simple, it moves a lot, everything is soaked, it's more driving than pure performance, I had a problem with my staysail, I could not manage Wrap, suddenly, it was a little damaged, it's been a day and a half that I'm under torment, I'm a little under-clothed, but given the conditions, it's better like that, I play caution, slowly but surely. I find atmospheres similar to what I experienced in the Drake in the Great South, a gray sky, a strong sea, there were even small petrels that sailed yesterday above the waves, I am in known terrain, even if it is a few degrees higher and the boat is not the same, I was sailing on a boat of 20 meters and 30 tons. I'm really happy about what's happening to me, it's a bit hard, but I have confidence in the boat and in my previous experiences, I have often experienced heavy gales, I do not have too much ball in the stomach. I'm always afraid that something foolish, a bit, a listening, a stay, but I'm pretty serene and I really enjoy every moment, it's an adventure quite exceptional that I'm living, I'm really happy to be there ". Through Lisbon, Sidney Gavignet repeats to the octave close the same score that succeeds so well to his colleague Pierre Antoine Class Rhum Multi. In the lead since the starting shot of the Mono Rum, the skipper of Café Joyeux explodes in the role of the solo sailor, living and sharing a significant portion of his life as a sailor. With nearly 200 miles ahead of his immediate pursuer Wilfrid Clerton, still serene at the helm of his huge Cap au Cap Location - SOS Children's Villages, ex Kriter VIII, Sidney is setting himself new challenges, competing with the best Class40 specialists. A race in the race that will take all its flavor once the tradewind meets in the eastern Açorian. The attention in Rum Mono is however focused on the back of the race, where the brave ones who refused to take shelter, contrary to 8 units of this group, will again be picked this night by a new low-pressure front, and its winds at 45 knots and more. There are no other loopholes for Dominique Dubois, Jean Marie Patier, Eric Jail, or Luc Coquelin, than to make the round back, clothed at a minimum and well caulked inside their boats. Yesterday from Camaret, the Marseillais Nicolas Magnan seeks again this evening a shelter on the side of Lorient.